Bacon filet mignon w/ truffle butter! I’ve been waiting to make Bacon filet mignon for a long time. In life, if you have something mediocre, tasteless, or healthy, what do you do? You wrap it in Bacon. But what about when you have the perfect mouthwatering tenderloin steak? You also wrap it in Bacon. Bacon may be the only meat worthy of wrapping itself in a big Bacon hug around filet mignon. We can probably all agree, life is better with Bacon. 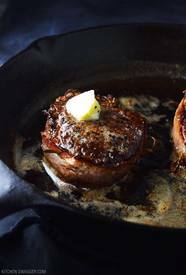 Wrapping filet mignon in Bacon adds flavor, it allows you to simultaneously cook in a little Bacon fat, it adds a crunch, and it helps keep your steak juicy. I consider Bacon-wrapped filet mignon a Valentine’s Day worthy meal with weeknight dinner ease. From prep to cleanup it’s about 25 minutes. Who would have thought something so classy could be so easy? Truffle butter is a very popular steakhouse butter made with truffle oil. Truffle oil is used on truffle fries, pasta dishes, pizzas, and many other dishes to add flavor and aroma. Mix truffle oil with unsalted butter and serve over your steak. It will melt into your filet and add worlds of flavor.